And, following behind her is Cheese as a LUA addon, written by Steel Titanium! Unfortunately, this means you won't be able to use her in Record Attack. Although, there's a LUA-less version that you can use, but that means Cheese won't be with you. So glad to see Cream (and Cheese) out and ready for action! I've been waiting for her for what felt like forever. 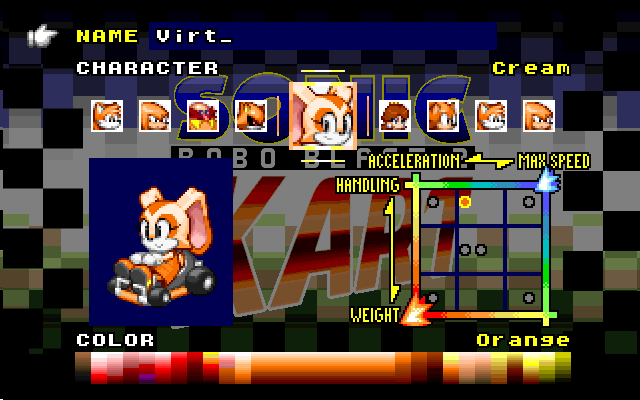 Clean spritework; Cream is incredibly cute here and your use of the orange palette is astonishingly good, I love this. I find the way Cheese frequently snaps into position when Cream starts or stops moving really jarring, and I also think that the distance threshold for Cheese turning transparent could be made way less sensitive. Sometimes he even turns transparent while circling around a standstill player. I've heard that Kart is getting in-built support for followers in a future release though, so I'm looking forward to seeing that in action with this adorable duo! Wow, I didn't expect this quality of this sprite! You're doing pretty good job creating her! Steel Titanium has made some adjustments to the script, so Cream and Cheese have received an update!